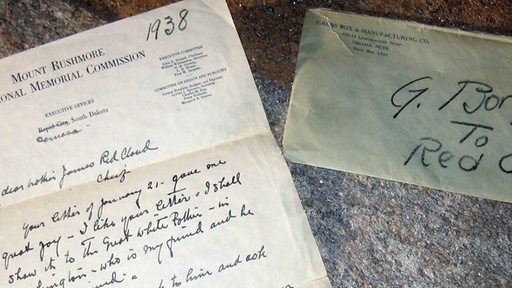 A Nebraska man obtained a curious letter from his grandfather, who spent time on South Dakota’s Pine Ridge Reservation during the early part of the 20th Century. The letter is from the sculptor of Mount Rushmore, Gutzon Borglum, to a Lakota leader named James Red Cloud. It makes several ambiguous references to treaties between the U.S. government and the Lakota, and, moreover, to Borglum’s desire to help the tribe. How was a leader of the Lakota people connected with creator of a monument that was regarded by many as a desecration of sacred land? History Detectives journeys to South Dakota’s Black Hills for the answer. Related Investigation Vicksburg Map Could this mysterious map have been at the front lines of one of the most explosive battles of the Civil War? Also in Emerging Modern America: 1890-1930 Nesbit Portrait Is this portrait a lost masterpiece by one of America's greatest artists? Also with Gwen Wright Pop Lloyd Baseball Field Why was this baseball field named after an African-American ballplayer in a time of racial tension? Also in Emerging Modern America: 1890-1930 Bill Picket Saddle Did this saddle ride into cowboy history with one of rodeo's most daring innovators? Also in Season 5 Howard Hughes Crash Was this the instrument that chartered Howard Hughes' near fatal plunge into Beverly Hills?